There’s something romantic about the French. From Hemingway to Woody Allen, Americans have long idealized France, depicting it frequently in art and literature. And as Tallahassee Francophiles Carrousel prove on their debut album, there’s no genre better suited to rainy Parisian streets or sunny days in Normandy than dream pop. Soaring, operatic and largely stunning, 27 Rue de Mi’chelle, is a mellow reflection on lost love and obsession. Carrousel are distinct for their ghostly vocals, orchestral arrangements, and sprawling soundscapes. As frontman Joe Piedt’s delicate voice mourns his broken relationship, layered vocals, and subdued cellos bolster his pain, and render the album all the more evocative. While gorgeous tracks like “14” and “Where Do We Go From Here” are individually excellent, the album is greater than the sum of its parts. 27 Rue de Mi’chelle is more than just cohesive — it’s symphonic. 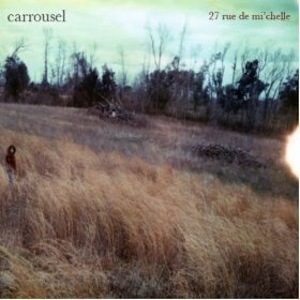 A heartbreaking and theatrical release that defies all criticism, Carrousel’s debut album is simply astonishing. Haunting and intricate, 27 Rue de Mi’chelle is a sign that there are great things to come from our new favorite Tallahassee dream-poppers.